As the dust settled on the races from this weekend, some familiar faces have emerged as the top returning runners for the 2018 cross country season. However, some teams came out with a statement establishing themselves as a team to keep an eye on this season. Let's recap the action from this past week for the boys of Kentucky. The season went off with a bang at the Swags Fern Creek Relays, giving teams a chance to do some mile repeats in a race setting. Jacob Steppe and Michael Krebs of Male were the champions while the Oldham County duo of Spencer Harvey and Jacob Brizendine took runner up. duPont Manual twosome Julian Powers and Nicolas Geary placed third. 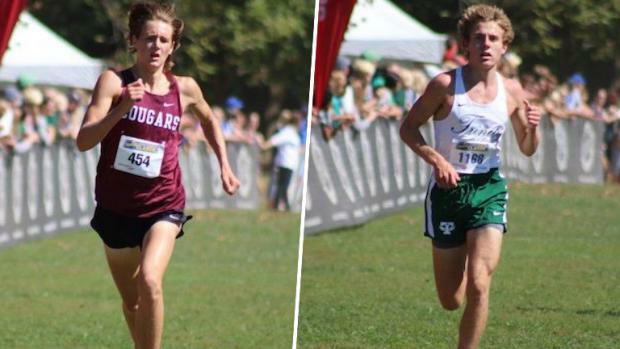 In our article earlier this week we highlighted some athletes that could surprise this cross country season and one of those gentlemen, Carson Sharber, placed third with his North Oldham partner Jackson Kuhn. duPont Manual's Powers followed up his Fern Creek Relays title with a team leading 34th place finish at the Tiger Run. As the Fern Creek Relays were being contested, the KY/IN Border Challenge was underway in Owensboro. Madisonville-North Hopkins senior Christian Parker took home the the title in 15:40.45 and was the fastest time run in the state early in this season. His teammate, Garrett Watts, placed third in the meet as their team came in 5th in the meet. Daviess County was the top team at the KY/IN Border Battle from Kentucky (Tell City in Indiana took the overall title). The Daviess County squad was led by sophomore Brady Terry, but it was the pack running that gave Daviess the top KY recognition with only 1:23 between their top runner and their fifth runner (placing 11-12-17-21-34). Then came the weekend! What a weekend it was. The first weekend is a chance to see how the summer training has worked, BUT does not determine your success for the whole season. Some coaches elected not to run on the weekend while others put out their top crew to see how they stacked up against the rest fo the competitors in late August. Remember, there are still 10 weeks until the state meet, so a lot of adjustment is still in the cards. I personally got a front row seat to a new meet for me at the Bourbon County Colonel Charge. The course was AWESOME! The meet management was impeccable. The competition was great for an early season meet. Bottom line here, if you ever have the first weekend of the season open, head out to Paris and join the Bourbon County Colonel Charge. The course is a winding, hilly path that never crosses so your athletes get a rare chance to see 5K of new scenery as they run to the finish line. This course is not a place to get that PR like some others that we have early in the season, however it is a quintessential cross country course. Aside from the great course, the competition did not disappoint. Scott County boys came out with an early season statement taking team title behind a 1-3-4 finish is James Wireman, Kaiden Johnson, and Jack Vinson. Class AAA Region 6 needs to keep an eye on this team. Their #4, Tyler Walker, was 13th and if they can close the 4-5 gap (39 seconds) they will be a real force well beyond Region 6. Scott County was not the only team with a pair in the top. Bracken County's Brandon Cox and Jared Jefferson had respectable performances as well on a course that is not near as fast as some others that were run on this weekend. The Scott County boys talked about their race afterwards. Check out the race footage as well! The Warren East Raider Twilight had its unique flavor with the races being later in the evening on a beautiful summer day. The racing was solid with Luke Spurrier of South Warren taking the individual title by over 30 seconds helping his team to a big win over the best in south central and western Kentucky. 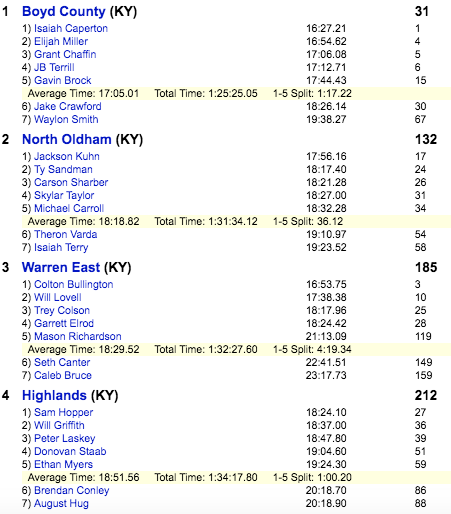 The Warren East boys are one of the top teams in class AA and South Warren bested them by 55 points. The team performance has placed South Warren as an early season top 10 team coming at 7th. Warren East's Colton Bullington placed second with Wes Grogan of McCracken County coming in third. Boyd County boys made a HUGE statement at the Boyd County Early Season Showcase with a 1-3-4-5-13 finish and a 1:17 split between 1 and 5 runners while establishing themselves as the top class AA team so far this season. Isaiah Caperton (16:27), Elijah Miller (16:54), Grant Chaffin (17:06), JB Terrill (17:12), and Gavin Brock (17:44) put Boyd County on the map with their race this week. Keep an eye on this team as they carry on throughout the season. We will get a good look at them on September 15 at the Franklin County Invitational. Most likely the most exciting boys team race of the weekend went to the Pulaski County Invitational as Pulaski County pulled out the team win with 53 points to South Laurel's 56 points. The Pulaski County squad was led by Elias Smith and Jeremiah Pierce in 4th and 7th respectively. South Laurel took the individual title with Drew Meader covering the course in 17:15.09 but it was the team pack of South Laurel that made the difference in the team standings. Some of western Kentucky's finest athletes stayed home this weekend to compete in the Madisonville Classic hosted by Madisonville-North Hopkins. The home squad took home the team title by 6 points over a much improved Marshall County team (17th last year at the state meet and now ranked 9th with current season times). The 1-2 punch of Christian Parker and Garrett Watts who had impressive performances in the KY/IN Border Challenge earlier in the week, pushed Madisonville-North Hopkins over the top. Marshall County's pack running was by far their strength. They had a 1-5 split of only 1 minute and placing 5-7-10-13-14. If that pack can remain strong and improve, watch for them to possibly break into the top 5 teams at the state meet. The twin duo of Mason Cosner and Christian Cosner led the Marshall County team. This is a welcome sight for the Marshall Count community as both were injured in the school shooting in January (story HERE). Now they are leading their team as juniors and establishing the team as one that can be a factor all season long. After some injuries put Connor Hayes on the mend during track season, he came out with a definitive statement in the Trimble County Backwoods Invitational taking the individual title in 17:26 and his teammate Andrew Madden placing second. The Lexington Christian boys won the team title easily with a team score of 49 to Butler's second place total of 82. Former KYtrackXC webmaster, Jonathan Grooms, took his team, Calloway County, to the Fulton County Invitational and came home with some hardware as the team won the invitational. Led by the 8th grader Dominic Cashion, the team placed all 5 scorers in the top 13. Better yet, the scorers were made up of two 8th graders, two sophomores, and a junior. This team is young and one to watch in the western part of the state. Notre Dame's Panda Classic brought a close team race with Holy Cross (Covington) and Villa Madonna tying with a score of 56 and the tie was broken by the 6th runner as Holy Cross had a 6th man in 16th while Villa Madonna did not have a 6th runner. Johnny Powers of Newport Central Catholic won the individual title in 19:40 with Lloyd Memorial's Hunter Belville placing second in 19:58. The biggest meet of the weekend by the numbers was the Tiger Run hosted by St. Xavier at Louisville Champions Park. The defending Kentucky Gatorade Cross Country Athlete of the Year, Keeton Thornsberry of Holy Cross (Louisville), took home the individual title in a time of 15:54.71. Thornsberry was third at this meet last year behind two seniors. Now that it is his senior season, he went out and claimed the title himself. He won by over 20 seconds and did not leave anything up for discussion as to who is the top runner in the state of Kentucky at this point in the season. A surprise came in the runner up position with Austin Stallings of Owensboro Catholic. Earlier this week Stallings placed 9th at the KY/IN Border Battle, however he came out with a solid 16:16.83 on a fast course at Louisville Champions Park, which was 28 seconds faster than we ran just 4 days prior. "brings a wealth of championship experience to the table that many other sophomores did not get as a freshman. He shines in the pressure situations as seen by his 5K and 1600 PRs coming from State Championship performances. With Holy Cross coming back to defend their state title, a top 5 from DK will be huge and give Holy Cross one of the best 1-2-3 punches in the entire state of Kentucky, regardless of class." The team race at the 2018 Tiger Run established that Trinity will be a force and can beat St. X. The Tigers have won six of the last seven team titles (only exception being 2014 when South Oldham won) but the Shamrocks have a team that can contend this year. Yes, St. X was missing Zachary Larkin, but Trinity was missing Shane Williams and Ryan O'Dea. The class AAA race will be more exciting than it has been in years past. A name to watch for St. Xavier is Blake Whiteley. Blake ran the freshman 4K and placed second behind Dalton Lesher of Bullitt East. He is a freshman that competed for St. Patrick as a middle schooler and now where the green and gold.